Socratic Seminars. Tea Parties. Historian’s Breakfast. Process Dramas. In today’s relevant classroom, simulations are everywhere. Simulations — intentionally staged activities and event that bring real world experiences in the classroom setting so as to enhance student learning — are an integral portion of a student’s learning and understanding of concepts in today’s global classroom. Simulations — no matter how simple or complex — are a powerful learning tool in that often mimic real life and real world experiences. 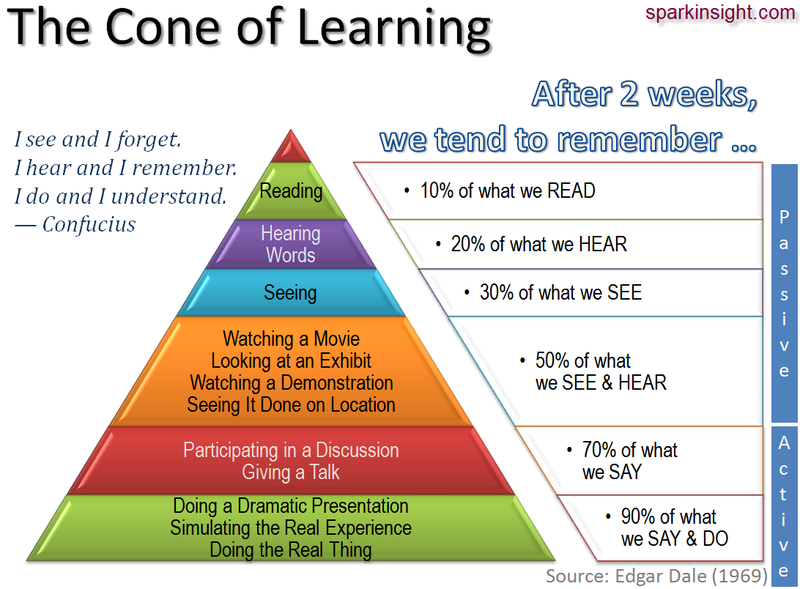 According to Edgar Dale’s Cone of Experience, the very best learning experiences occur when doing the real thing. Simulations fall only second to the “real thing.” Therefore, to create meaningful learning for students, simulations should be planned and included in their educational process. So what does this mean for a school counselor? How can a school counselor create simulation experiences that are meaningful, authentic, and have a lasting impact on student learning? How does a counselor engage students using simulations that impact the academic, social-emotional, career, or global development of a child? Should school counselors spend time creating simulations or should that work be left to homeroom teachers? Just like a homeroom teacher, a counselor should be skilled in creating simulations to engage student inquiry and learning. One way I have managed to successfully use simulations to create meaningful learning opportunities for students is during our elementary to middle school transition program. In spite of all three divisions being housed on the same gated campus, our grade 5 students complete a comprehensive transitions guidance program. This includes classroom guidance around reflecting on the elementary and PYP experience, having questions answered about middle school and the MYP, participating in middle school tours, meeting middle school ambassadors and advisors, attending a middle school assembly, and more. However, what came to surface is that even with all this programming, students still walked around with a lot of unease and trepidation about what middle school looks like, feels like, and sounds like. The unknown experiences were causing a lot of stress. I could answer all the questions I wanted about changing for PE but since the students had never experienced this activity — their unease remained. 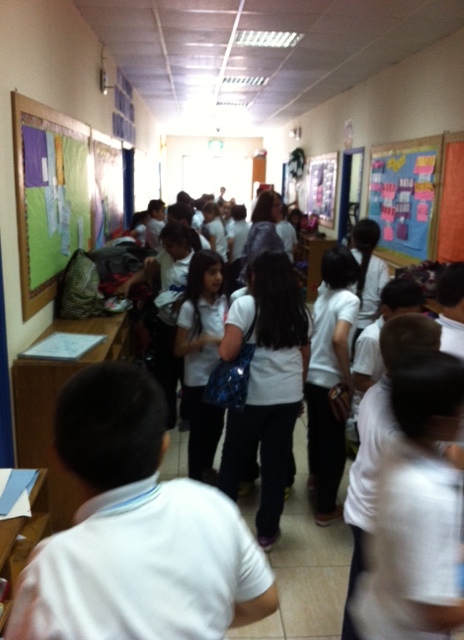 After consulting with the grade five teaching team, a Middle School Mock Day simulation was designed and implemented. This means our grade 5 students spend a whole day experiencing middle school in the comfort of their own elementary hall. Students in first five minute transition period. Chaos ensues. How it works: Each homeroom teacher is assigned a teaching subject for the day. 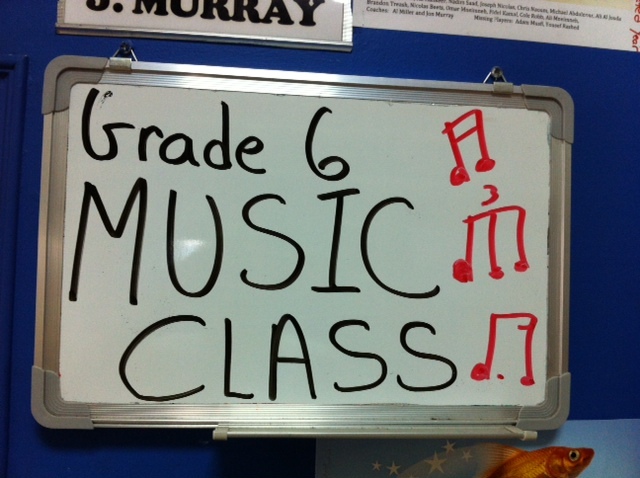 These subjects are based off the current offerings our grade six students have. We bring in specialist teachers to cover specific subjects and to create prep periods for our homeroom teachers. A master set of student schedules is created based on the middle school timetable (55 minute classes with 5 minute passing periods). Students are assigned a schedule at random with consideration being made to accommodate mother tongue class needs. 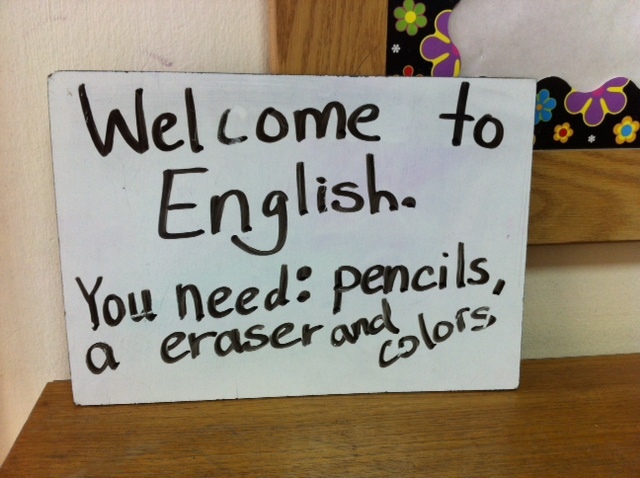 PE space, break space, canteen needs, supervision, and supplies are all arranged as necessary. A meeting is held with all staff involved or impacted by Mock Day to go over logistics and questions. Students are then briefed about the day and informed that, just like in middle school, they are going to have a random, rotating schedule of classes that is made up of random groupings of their peers. They are informed that they might not have all the classes being offered (as true at the middle school level) and that they might have different peers in each class. They are also notified about now only having one lunch break (compared to the 2 in elementary) as well as only having one small “play” area instead of a playground. They are told about the daily advisory class in middle school which in the simulation means the students go back to their homeroom teachers to do some debriefing and reflecting about the day. Just like in middle school, advisory is a brief time with a trusted adult to discuss current things happening in the students’ lives and create strategies or interventions to solve problems and be successful. In the Mock Day simulation planning process we try to balance the amount of information we provide students so that they are comfortable while still leaving room for inquiry and for an organic experience to unfold. It is important to let the day play out for the students — we have not made everything “safe” for them which would create an inauthentic experience as there are always unknowns in life. On Mock Day, students arrive to school with their schedules and begin the rotation process. A bell is used to indicate the start and end of classes and warnings are provided as the 5 minute passing period counts down. When staff see students struggling, frustrated, or perhaps engaged in an undesirable behavior, we pull the student aside to have a conversation and to make a connection to middle school. Every situation is presented as a learning experience. The energy at the start of Mock Day is high. Students are excited, staff are engaged, and learning is occurring authentically. Not only is there the academic learning, but more importantly, social and emotional learning is taking place. It is amazing to see the student energy shift throughout the day when students get settled in. The frenzy dies out and the confidence sets in. Students are spending more of their transition time at their cubbies (lockers), having snacks between classes, visiting with friends. Also, after their PE changing experience when students successfully change clothes, fill their water bottles, and make it to class on time, the smile on their faces is evidence that this unease about changing is diminishing — through experience, the students have developed in the social-emotional domain. By the end of Mock Day, students are tired yet happy and invigorated. The feedback/reflection sheets are genuinely positive and supportive of the simulation process. Student feedback shows an increase in confidence about middle school, a connection that middle school is not that different from middle school, an excitement to move up to the middle school campus, and a lot of thanks for having the mock day simulation. So, do simulations have a place in guidance? Is it the school counselor’s responsibility to provide experiential learning opportunities for students? Absolutely. By providing a Mock Day for our students, the middle school transition process moved from theoretical to concrete. Students developed not only in the academic but also the social-emotional domains. Through a simulation, students were able to experience activities that helped alleviate concerns and fears. The simulation helped students develop confidence and understand that in all actuality, middle school is not so different from elementary. Most importantly, the simulation allowed students to face the unknown in a supportive, familiar environment surrounded by their peers and teachers who could address concerns and celebrate successes as they happened. This is one method of using simulations to promote guidance activities. What are some other ideas on how to use simulations as a school counselor? How have you used simulations to support the academic, career, or social-emotional development of students? It is the time of year in IB Primary Years Program schools where the upper grade students are diving into the world of the PYP Exhibition. The goal of the exhibition is to help students synthesize their understanding of the PYP through student centered group inquiry. The reality is that with all this student centered group inquiry also comes a lot of group conflict. In my current school community, part of the exhibition process includes proactive classroom guidance lessons around conflict and conflict resolution. Over the past few years it has become evident that providing students with a simple framework of how to address conflict when it arises has reduced the amount of conflict that impedes student productivity and negatively impacts the exhibition process. The American School Counselor Association Model’s Personal/Social Domain notes that through self-knowledge application students will “use a decision-making and problem-solving model” in order to “make decisions, set goals, and take necessary action to achieve goals” (ASCA, 2005). The International Model for School Counseling Programs Global Perspective Domain also notes that student should “recognize that cultural values and beliefs may conflict” (IMSCP, 2011). With these guiding documents in mind, I developed guidance lessons to prepare students for the impending conflict that is enmeshed in a group of 10 year olds creating and unpacking their own inquiry cycle. The Lesson: To start the lesson, students did a brief Think-Pair-Share around the word conflict. What is it? How do we define it? Where have we observed conflict before? We then spend time dialoguing about how conflict can be positive and healthy if we work through conflict to solve problems. Students are typically challenged the idea that a “problem” or “fight” can be a good thing and it typically takes some concrete student-shared examples of times when conflict was resolved to fully grasp this concept. We then spend time as a class exploring what might cause conflict. Being in an international community, some common answers include “being from different countries, being from different religions, believing different things, liking different things.” Students make the connection that cultural differences or something as simple as what country one is from can create natural conflict. 1) Communicate: Use “I statements” to explain your point of view. Remember that communication means talking and listening. Attack the problem, not the person. 3) Compromise: Remember that this needs to be a “win-win” situation for all parties involved. Everyone needs to walk away feeling good about the decision being made. *Some ways that grade 5 students noted they could reach compromise include flipping a coin, picking a number between 1 and 10, taking turns making the decision, rock, paper, scissors. Whatever you choose, make sure all group members agree on the outcome first. 4) Try and try again: If the idea does not work or the conflict is not resolved, pick another idea and start again. Remember that working through conflict takes work and is a skill that we have to develop and learn over time. After we create an anchor chart with the 4 steps to conflict resolution, a case study is presented to model the steps. Students role play and share out their methods of resolving the conflict in the case study. Finally, the conflict becomes real for the students as an activity is introduced. Students are divided into groups of 4. 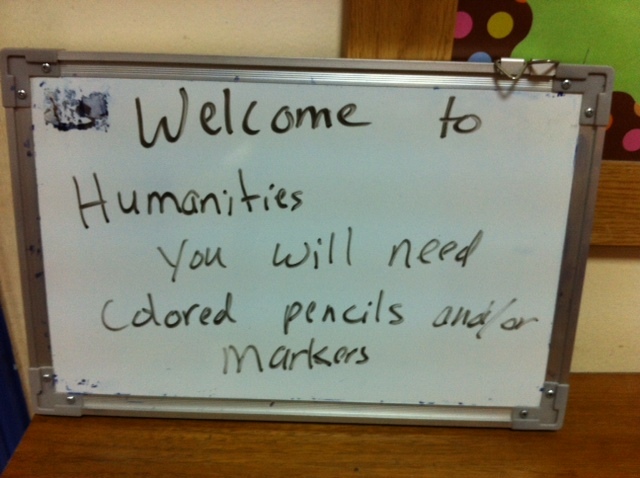 Each group is provided a marker and some paper. Each marker has 4 equal pieces of string taped to it. Each student can hold one string at the end of the string. They are not allowed to touch the marker, paper, or move their hands up the string closer to the marker. They are presented the challenge of having to draw pictures as a group holding only their string. Time is provided to Communicate and Think (Brainstorm). The first challenge is presented (“Draw the letter ‘A'”) and the conflict ensues. As groups work to complete the assigned task, tensions arise. Voices get loud. Emotions escalate. Typically some groups stay calm and work together. More commonly, groups become very tense, agitated, and begin to implode unable to complete the task. After a few moments, the task is stopped and students are asked to be reflective. How many had conflict? How many continued to communicate, think, compromise, and try new strategies? How many used attacking language and gave up? What would need to change for their group to be successful in their second attempt? As the activity continues and the challenges get a little more difficult (draw a triangle, square and circle. Draw your teacher), groups continue to struggle through with conflict. Some become more aware of stopping to talk, re-strategize, and listen to one another. Others continue to be caught in frustration and unable to be productive. When asked, “What do you think this activity has to do with exhibition?” many students understand that it will take a team to create a final project. Most likely there will be conflict within this team. The best thing is to stay solution-focused and work through the tension before it gets too big to manage. The guidance is not a catch all. Through the exhibition process there is still ample conflict we guide and assist groups through. However, being proactive in teaching conflict resolution skills and normalizing group conflict provides a healthy jumping off point for groups as they head into the rewarding, yet stress, exhibition process.